We are thrilled to announce a very special contest on Bookreporter.com featuring Carol Fitzgerald’s Bookreporter.com Bets On picks from this year. One Grand Prize winner will be awarded ALL of her 28 selections for 2012, while 28 others will win a copy of one of these titles. Spring has sprung! We’ve caught the fever --- and so have the publishers. Here are some picks that we know people will be talking about over the next few months. TRUE SISTERS by Sandra Dallas looks at the story of how, in 1856, the Church of Latter-Day Saints (LDS, or Mormons) brought converts from Europe to Iowa, where they were fitted with handcarts that they pulled and pushed 1,300 miles to Salt Lake City. The carts were essentially square boxes on two wheels. The four women portrayed in the book were members of the Martin Company, the last group to head out that had 575 people in it when they left. Along the way, they lost one quarter of the group to harsh conditions, including blizzards and deathly cold. While the Donner party is referenced in history as the story of a magnitude of human loss, it is dwarfed by this. 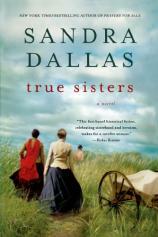 TRUE SISTERS by Sandra Dallas tells the story of four women, brought together on the harrowing journey of the Martin Handcart Company, and united by the promises of prosperity and salvation in a new land. Through the ties of female friendships and the strength born from suffering, each one tests the boundaries of her faith and learns the real meaning of survival along the way.